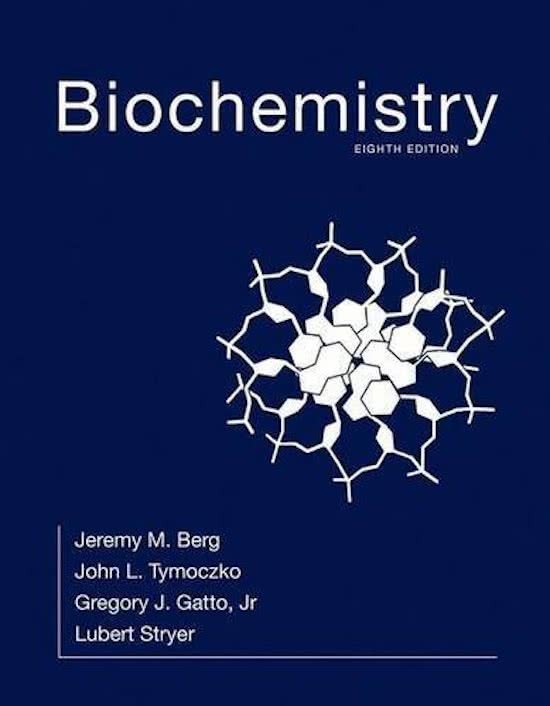 Biochemie Summary of the book "Biochemistry" (Jeremy M. Berg et al., Biochemistry, Eighth Edition, WH Freeman and Company, 2015). See table of contents in the preview for the summarized chapters. Summary Enzymology (BIC-20806) In this summary of the course Enzymology (BIC-20806), which is given at Wageningen University, all the theory that needs to be mastered for the exam on the 'Biocatalysis' part of this course is described in detail. This means that this summary includes the lectures of this course as well as the reader of this course. Biochemie English summary (sometimes Dutch additions) of the lectures of the course Biochemistry (VU Amsterdam). Clearly with learning objectives and images. To be used for the first partial exam of Biochemistry! Samenvatting Enzymology BIC20806 Summary Enzymology (BIC-20806). The document is a summary of the reader and the lectures. All important aspects for the exam are explained. Biochemistry CHAPTER NINE: OVERVIEW OF METABOLISM CHAPTER NINE: OVERVIEW OF METABOLISM is the perfect summary/notes for McMurry's organic chemistry. Its all you need from chapter nine. Chapter 11: Glycolysis Summary and outline for Glycolysis. Sur cette page, tu trouveras des résumés, des guides de révision et bien plus de livres de révision Biochemistry, écrits par Jeremy M. Berg & John L. Tymoczko. Les résumés sont écrits par les étudiants eux- mêmes, ce qui te donne les meilleurs renseignements sur ce qui est important de réviser dans ce livre. Les sujets tels que Biochemie, Enzymology, Enzymologie, metabolism, BIC, Biocatalysis, Detoxification & Drug metabolism seront traités.